If you like to judge a book by its cover, here's a mixed metaphor: the title is 'Deepening democracy in a fragmenting world', but the image shows pigeons flying out of drawn out hands. Depth and flight don't make an easy marriage. But this, perhaps, would be reductionism. The Human Development Report 2002 of undp offers some vital indicators about the politics-development link. The report is as much a report card of 173 countries' performance in human development as of democracy, which gained currency in the past two decades as never before. In this period, "81 countries took significant steps towards democracy, and today 140 of the world's nearly 200 countries hold multi-party elections..." And then there are the sobering statistics: of the 81 that dallied with democracy, only 47 are 'fully democratic'. 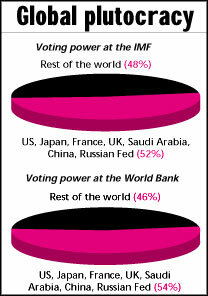 Overall, only 82 countries, with 57 per cent of the world's people, are fully democratic. Does this spread of democracy translate into improving the lot of humankind? Not quite. While there are some good signs, it would take the world 130 years to rid the world of hunger at present rates. And while the proportion of the world's population living in extreme poverty fell from 29 per cent in 1990 to 23 per cent in 1999, the number of such people in sub-Saharan Africa (which has moved towards democracy) rose from 242 million to 300 million in the same period. The richest 5 per cent of the world's people have incomes 114 times those of the poorest 5 per cent. "...the recent mixed experience with democracy in these countries -- and around the world -- shows that the process of deepening democracy has barely begun. Why is there less optimism about democracy today than in the euphoric period just after the cold war?" the report questions. The answer: "...democracy in itself does not guarantee greater social justice, faster economic growth or increased social and political stability. The links between democracy and human development can be strong -- but they are not automatic." If the link is so strong, how does the report explain India -- the largest democracy in the world and one of the oldest in the developing world -- being ranked 124, much lower than non-democratic states such as Saudi Arabia (71) or China (96)? Well, it doesn't. One of the reasons democratic institutions fail to deliver, says the report, is that "bureaucrats are underpaid, overworked or both". Now this seems like a joke for anyone who has set a foot in a government office in India. The report points out that democracy has been reduced to electoralism in many countries. It also talks about decentralisation of power to local governments. "Only if accompanied by strong support to community groups can decentralization empower ordinary people," it recommends. For example, in India, most state governments are yet to make any progress on Panchayati Raj institutions (see our cover story). The report doesn't discuss how poorest people in the developing countries rely on the natural resources, and how this base is degraded and polluted after governments -- many of them democratic -- have taken over the ownership of these resources away from the communities. The report gives short shrift to environmental concerns. So what does it say about international democracy? It gives the example of the appointments to top financial bodies. "Formally, all members of the IMF and World Bank executive boards are supposed to appoint the institutions' presidents. But by convention, Europeans select a candidate for director of imf and the us government selects the head of the World Bank." This lack of democracy also shows in the World Trade Organisation. "Although all countries have a seat and a vote in the wto, actual decision-making occurs in the "green room" -- the small group meetings convened by the director-general and heavily influenced by Canada, the European Union, Japan and the United States. Most developing countries are usually excluded."